We all do our best to keep sugar to a minimum. However, there are times we are consuming it without it being at the forefront of our minds. While we can cut down on anything we would normally add sugar to, like cookie recipes, coffee, and even some cereals, we may still be missing out on some of the bigger sources of sugar that are hiding in plain sight. Fruits and vegetables are all sources of sugars, even though the sugars are natural. If we are eating the raw fruits, the sugars go to our natural bodily functions that require sugar. If you are trying to cut down on the sugar in your diet, stick with 80-90% vegetables and the rest as sugar-heavy fruits. Milk is a source of sugars that not commonly known. While milk is incredibly important for our teeth, we need to make sure we are drinking the right type. The lower the sugar, the better it is for our mouths (and the rest of our body). If you are going to drink milk for the health benefits, drink it straight. Don't add flavorings or anything to make it taste any sweeter. Cereal has a lot of sugar in it, more often than not. And nearly all of it comes from corn syrup, which is the type of sugar you want to avoid for a healthy mouth. If you are a big cereal eater, make sure you are eating the most nutritious cereals around so that you can get the benefits of the food, and not the downsides of the sugar. 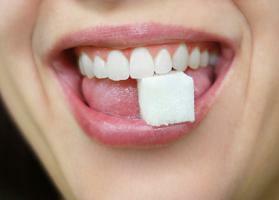 For more hidden sugar dangers, contact our office. He or she can tell you where you may be missing bits of sugar that could be replaced with healthier alternatives.